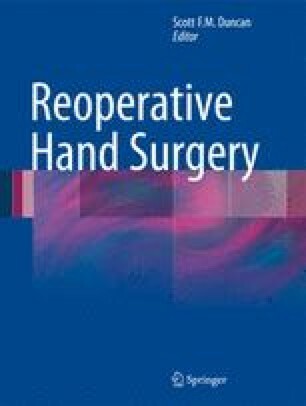 Replants can be one of the most challenging and technically difficult procedures that the hand surgeon will face. Failure of replantations can occur both interoperatively as well as postoperatively. Interoperatively, there are mechanisms to try and reduce vasospasm as well as reduce thrombosis. These principles are important postoperatively as well. If a replant has been doing well and then changes in the immediate postoperative period, exploration may be warranted. In these cases, sometimes a reversed interpositional vein graft will help. Other techniques including further shortening, subcutaneous pocketing, and retrograde/antegrade arterial drainage techniques can be utilized. In the cases where the replant is not salvageable, revision to an amputation will be needed. If the replant has been unsuccessful interoperatively, then a primary amputation is very reasonable option. Otherwise if the replant fails late or for other reasons the surgeon can wait and perform the amputation secondarily after demarcation. As far as reconstructive options for failed replantation, many patients may choose no further surgery. However, other osteoplastic reconstructions, flap surgeries, or toe to hand transfers can be performed. Each case is very unique, but this chapter will hopefully give the reader some guidelines and a better feeling on how to treat these unfortunate and difficult injuries.